Stormzy has announced a publishing deal with Penguin to help young writers become published authors. The rapper will also be releasing an autobiography and creating a paid publishing internship in 2019. The grime star wrote on his Instagram page to say "reading and writing as a kid was integral to where I am today". He added: "I know too many talented writers that don't always have an outlet or means to get their work seen." Known as #Merky Books, his imprint will publish two to three books a year, starting with Stormzy's autobiography Rise Up. "I from the bottom of my heart cannot wait to hear your stories, your poems, your novels, your sci-fis and then getting them out into the big wide world," he wrote. "We'll be doing school competitions, taking entries and submissions and looking for writers as well but I'll keep you posted!" 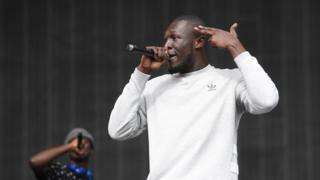 Stormzy, real name Michael Omari, already has a record label called #Merky, which has a deal with Atlantic Records to release his own music and to find "fresh new talent". The 24-year-old was the first grime artist to achieve a UK number one album, topping the charts with his debut Gang Signs and Prayer in 2017. It went on to earn him the prizes for best album and best male at the 2018 Brit Awards.